The term Kung Fu (功夫) is written in Pinyin as Gong Fu, which is a more accurate and appropriate pronunciation. The term is made up of two characters: the first, Kung (功), can mean skillful work, hard training, or endeavor. The second, Fu (夫), means time spent. Together they mean time spent at skillful work, endeavor or hard training. In no way does this term express the totality of Chinese martial arts, but because training in Chinese martial arts requires a lot of time and hard training, the term somehow came to be used to describe the practice of martial arts. 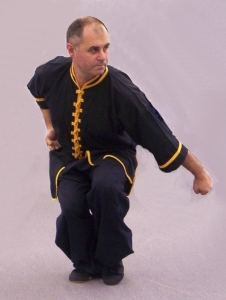 Wu Shu (武術) is probably a more correct term to apply to Chinese martial arts. Wu means war. Shu means art. So Wu Shu means war art—the art of war. This term is appropriate because the study of traditional Chinese martial arts involves not only the skillful use of kicking and striking, but also wrestling, grappling, weapons training, and strategy in combat. In mainland China, the term Wu Shu is now used to categorize all aspects of Chinese martial arts. Indeed, Wu Shu is China’s national sport. However, modern Wu Shu, as it is now being taught in China, has lost many of the original functions and martial applications of the traditional styles, and it has become more of a sport and less of a useful martial art. Many other terms can be used to describe Chinese martial arts: for example, Quan Fa (法拳) – Fist Method, Zhong Guo Quan (中国拳) – Chinese Fist, Quan Shu (拳術) – Fist Art, and Guo Shu (国術) – National Art. Today, Kung Fu is practiced all over the world by people from many cultures. It is evident that with the current growth of Kung Fu and the efforts to promote it by the mainland government, Chinese martial arts within the next 10 years will rise in popularity well above the other Asian martial arts.